Why content is more effective than Adwords. And not just for hotels. For smaller hotels and resorts, the lack of taking control of their online marketing is growing into a horror scenario. A not even so long time ago, they stepped into what they believed was a partnership with an OTA for their online marketing. What they did not know by then, is that OTA’s don’t make partnerships; they only make business for themselves. OTA’s do not focus on the well-being and occupancy rate of the hoteliers; OTA’s only focus is on the consumer. The hotel is nothing more than a supplier. OTA’s use hoteliers to provide a room, for a rate the OTA wants to offer to the consumer. If hoteliers do not accept the OTA room rates, the hotel will simply not appear in the OTA promotion or even search results. If you depend for more than 30% on OTA’s for your occupancy rate, you are in trouble. And it can only get worse. What can hoteliers do, to get some attention online and hopefully direct bookings? Hotels can advertise, or hire a PR agent to get some stories about the hotel in fashionable or trendy travel magazines. Hotels can also choose to boost their visibility on-line with some advertising. If you have no online marketing skills, you will search and find information about online advertising in Google, with a solution by Google, called AdWords. Some hotels are so happy with this possibility, that spend their online budget on AdWords, you know those sponsored links on the Google result page. Or hotels buy Adlinks; to get their hotel annoyingly displayed in the browser of a possible consumer. As if people appreciate unsollicited advertising. Advertising is soo 2014. Adwords is one of the best ways to throw your money in the water, if your website does not have the right content. PPC (pay per click) might seem a good deal; but here’s what Google does not explain to you. When you set-up your first Adwords campaign, you will notice that you need keywords to define your audience and to explain to Googlw why your hotel is the best match to show. 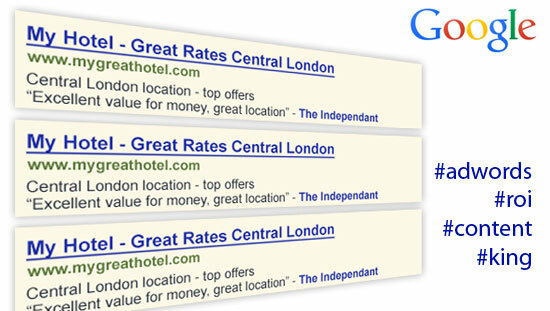 Google assigns keywords a Quality Score, dictated by the quality of the content on your hotel website landing page. Good content on your website boosts your Quality Score, which, in turn, boosts your ad position, all while lowering costs. But, if you have static content on your website and you do not post, add or change your content weekly, Adwords will work against you. And it makes sense; after all Adwords are like a Billboard. The message points a driver to visit a hotel, at the next exit>click. When the guest arrive and the hotel looks bad (in terms of content and eye-candy online) the future guest will click further to find something more interesting. Because the visitor did click on your BillBoard/Adword, you just lost a few dollar because you did not pay attention to content. When the monthly Google invoice comes, you wished nobody clicked. But they all did. People click; people look and then click away because they did not find anything appealing in your content. Before you start to invest in Adwords and a SEA campaign, think a step before that: is your content fresh and up to date? Quality content is all what matters. Adwords can help you to steer extra traffic to your website. But if you do content marketing right in a combination with e-mailings and social media, you won’t need Adwords at all. Save your budget for Adwords and invest in a clear digital content marketing strategy. Great stories with proper key word density are found by the right people because they search for stories, for inspiration and finally for your hotel as a home-base to become part of their own story, in your region. Give them that experience, and a bonus if they book with you. Or when they come again with friends. Think out of that Excel box; create unique packages that are worth writing about. OTA’s can’t create packages, but you can! If a hotel would focus on the customer, and start with sharing and caring online, they can beat the OTA’s. Because OTA’s only have a price weapon. But you! Hey, you have the hotel and the local knowledge, and that is worth a lot more. Hoteliers need to understand that the game can be changed. It takes some guts, local stories, SEO expertise and a creative agency that can do this for you. Is that a PR agency? No. Is that a web agency? No. Is that an advertising agency? No. A SEO company? No. To survive online and be sure to push all buttons right, you will need a communication agency that understands branding, online, off-line, SEO, sales and content. No wonder you were still struggling in finding a good solution. Maybe this article helped you to steer your marketing strategy into a more efficient way of getting new direct bookings. Because a direct booking, after these words, is all that matters. Share the post "Why content is more effective than Adwords. And not just for hotels."